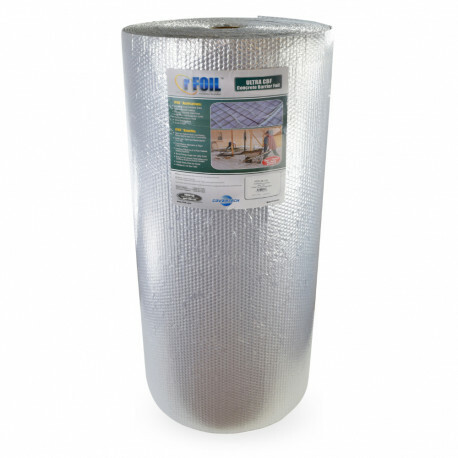 rFoil Ultra CBF insulation is a multi-layer insulation comprised of highly reflective metalized foil sandwiched between 2 layers of heavy-duty poly bubble. It is designed for use in concrete under-slab insulation applications with or without radiant heat. Ultra CBF vs. 1" rigid foamboard: Ultra CBF has R-3.8, which makes it a very cost-effective, and, in most cases, suitable replacement for 1" foam board insulation (R-5.0). 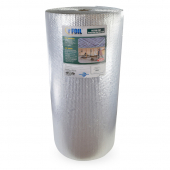 It has far greater compression and tensile strength acts as a vapor barrier and is resistant to mold and fungi. 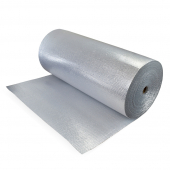 It can also be used for slab edge insulation. 4ft x 125ft roll covers 500 sqft of space and does not require extensive/time-consuming/costly seam taping common in rigid foam insulation. Multiple lengths can be taped together using rFoil (part# 15853) 3" poly tape or similar. Non-shrinking, resistant to insects, fungi, bacteria. Multi-layer 14.2 mil bubble core.